The Apple Watch Series 4 will be designed to detect whether the wearer has slipped, tripped, or fallen over, and will automatically alert emergency contacts. THE Apple smartwatch could become something of a doctor on your wrist after Apple revealed new medical sensors designed to warn wearers of heart conditions they might not yet know about. And, perhaps most unusually, the Apple Watch Series 4 will also be designed to detect whether the wearer has slipped, tripped, or fallen over, and will automatically alert emergency contacts. The new Apple Watch, unveiled at the company's Cupertino campus this morning and due in stores next Friday, will offer an electrocardiogram feature for the first time that can measure users' heart rhythms to detect signs of atrial fibrillation. 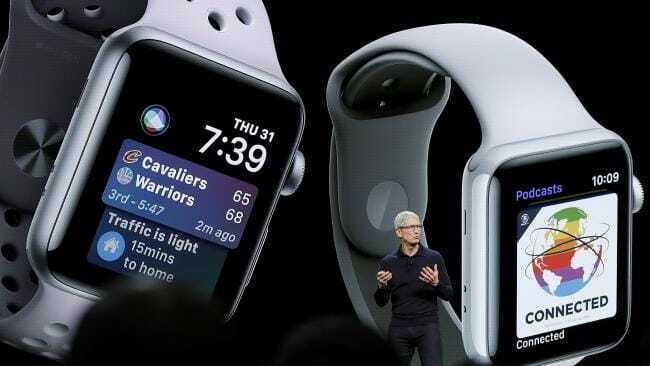 Apple chief operating officer Jeff Williams, who introduced the next generation said the company had completely "re-engineered" the leading smartwatch, to become a medical device approved by America's Food and Drug Administration. "This is the first ECG product offered over the counter directly to consumers. Now you can take an ECG any time, anywhere, right from the app," he said. "We believe this is going to help a lot of people who didn't otherwise know they had an issue." 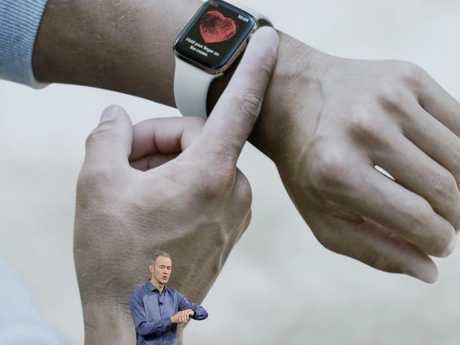 Mr Williams said Apple Watch 4 users could undertake an ECG test by placing a finger on the watch's crown, though the watch could also monitor wearers' heart rhythms in the background and deliver alerts if unusual beats were detected. Apple's new smartwatches would also feature automatic accident detection for the first time, Mr Williams said, and had been designed to measure the difference between a user slipping, tripping, and falling. Mr Williams said if the Apple Watch did not detect movement from the user for a minute after a fall, it would automatically alert their emergency contacts. "It's a feature we hope you'll never need but it's nice to know it's there," he said. The new smartwatch will also feature screens more than 30 per cent larger than before, a slightly slimmer body, a chip up to twice as fast, and a new gold stainless steel option, though no change to its battery life. Worldwide sales of smartwatches are expected to reach 48 million this year, according to Gartner, up almost seven million on last year. Telsyte managing director Foad Fadaghi said Apple smartwatch"continued to dominate the Australian market," and the newest model was likely to receive a warm reception from consumers looking to upgrade from their current watch or basic fitness band. "The killer app for most who have been holding out has been longer battery life, something that doesn't require daily charging, and possibly a larger screen to make it easier to type on," he said. The Apple Watch 4, which will be available to pre-order from this Friday, will compete with a new model from Samsung, however, which revealed plans to launch its new Galaxy Watch in Australia next month. The Apple Watch Series 4 will start at $599, and the 4G version will cost $749. Jennifer Dudley-Nicholson travelled to Cupertino as a guest of Apple.